Diller, Scofidio + Renfro announced today that their reorganization of the Museum of Modern Art will include the replacement of Tod Williams and Billie Tsien’s former American Folk Art Museum at 45 West 53rd street. Liz Diller said in her briefing that DS+R hoped to save the Folk Art building and repurpose it into a usable exhibit space or a connecting bridge between the new Jean Nouvel tower (which will have three floors of MoMA galleries) and the older parts of MoMA. However, “saving” the structure with its misaligned floors (to MOMA existing galleries) would mean compromising the integrity of the Williams Tsien structure. 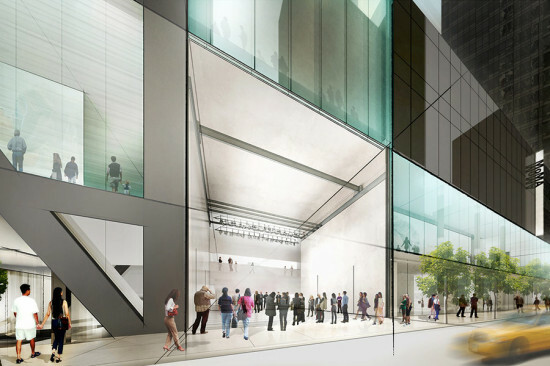 We have learned of MoMA’s final decision to raze the former American Folk Art Museum building and replace it with a new structure. This action represents a missed opportunity to find new life and purpose for a building that is meaningful to so many. The Folk Art building was designed to respond to the fabric of the neighborhood and create a building that felt both appropriate and yet also extraordinary. Demolishing this human‐scaled, uniquely crafted building is a loss to the city of New York in terms of respecting the size, diversity and texture of buildings in a midtown neighborhood that is at risk of becoming increasingly homogenized. This is a building that we and others teach from and about. It has served as an invaluable learning resource for students, colleagues and scholars, and a source of inspiration for many more. It has a powerful architectural legacy. The inability to experience the building firsthand and to appreciate its meaning from an historical perspective will be profoundly felt. As architects, we must be optimists. So we look to the future and we move on.